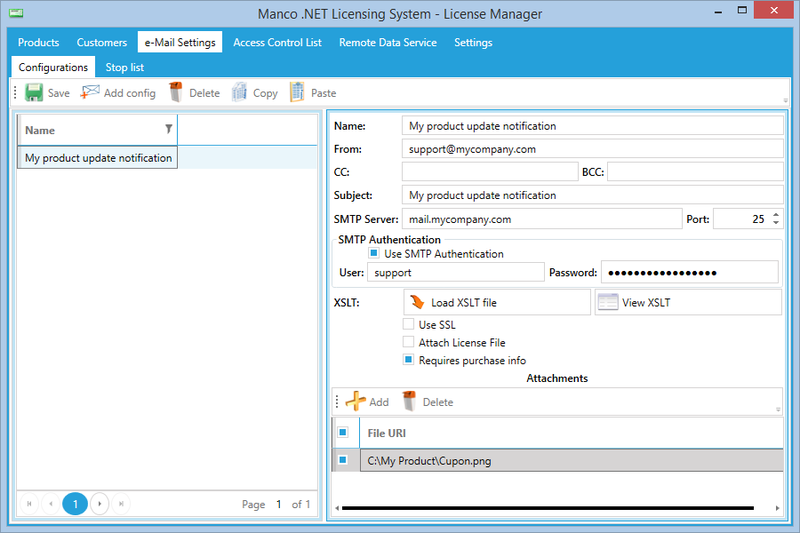 License Manager allows you send e-Mails to your customers. You can do it from the “Products” or “Customers” tab. 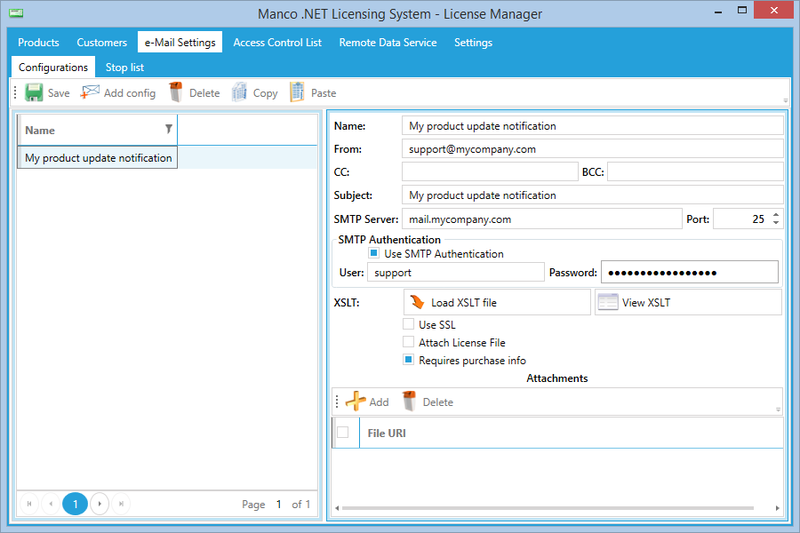 To send a message “License Manager” uses one of the e-Mail configurations are presented on the “e-Mail Configuration” tab. Before we could send e-Mail we should create e-Mail configuration. Select “e-Mail Configuration” tab in the License Manager. Click toolbar button. New e-Mail configuration will be added. Rename it (“My product update notification” for example). Most fields on the e-Mail configuration view are good known for most people are using e-Mails in their practice. From – your e-Mail address. SMTP Server – URL or IP address of the SMTP server will be used to send e-Mail. If your SMTP server requires authentication then you should check “Use SMTP Authentication” checkbox and fill “User” and “Password” fields. E-Mail template is presented as XSLT description. To send e-Mail you should load XSLT description from the file. Click button and select XSLT file to load. See Appendix A for structure of XML data passed to the XSLT for transformation. If you’d like to send license file as e-Mail attachment then you should check “Include License File” checkbox. Click button. Empty attachment row appears. Enter full file name or click button at the right of the text box. When all necessary fields will be filled in click toolbar button to save changes made. In the “Manage sales” window select customer you’d like to send e-Mail to. In the “Sales” list of this customer select sales you’d like to include to the message by checking checkbox at the left of the correspondent sale record. You can select as many sales as you’d like or don’t select anyone if you need not to include information about sales into the e-Mail. Select e-Mail configuration in the combo box or leave it empty to send default e-Mail. The default e-Mail is one which is configured as “Purchase Letter” in the Version view. Go to the “Customers” tab and search for the customers (see details in the Search customers using License Manager). By default you can’t select multiple customers in the grid. Click to allow multiple clients selection. This functionality is not available from the evaluation version.